I hope everyone had a wonderful 3 day weekend. We definitely took advantage of the time off and beautiful weather to spend some quality family time outside. A fun train ride up the canyon, a couple bike rides, a picnic, the first swim of the summer and of course some good grilling. I am absolutely exhausted and convinced that as a mom...I will never experience a relaxing holiday or vacation ever again. Fun yes! But relaxing...no. Does anyone else watch 'Modern Family'? On a recent episode Claire, the mother of 3, had the best quote. "I'm a mom traveling with my kids. This isn't a vacation, it's a business trip!" I have never laughed so hard, because it's soooo true! I get it, and I only have one kid. I'm going to extend that quote to holidays as well. We moms put a lot of time and effort into planning, executing, managing and cleaning up from holidays, vacations, trips etc... It's our job, not our leisure. But we do it because we love it and we love our families and we know we're creating memories that will last a lifetime. Right??? At least I remember....I am one of those moms, because I had one of those moms...so thanks mom! Anyway, on to the recipe for today. 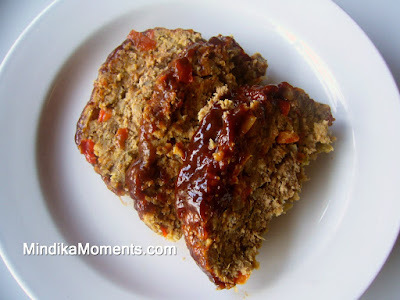 I know I just posted a meatloaf recipe, but I've been doing a little more experimenting and I've come up with another one. This one's not as fancy as the Gorgonzola Stuffed Meatloaf, but it's just as good. It has a whole different flavor profile; a little more southwest. It was delicious! I served it with grilled corn on the cob. 2. In a small skillet cook the diced bacon until desired doneness (I like mine crispy). Drain the bacon and set aside. 3. Reserve about 1 tablespoon. of the bacon fat, throwing the rest out. In the same pan with the bacon fat, sauté the onion, pepper, jalapeno and garlic for 3-4 minutes or until the veggies are tender. 4. Mix together the beef, bread crumbs, bacon, veggies, egg, salt, pepper and ½ cup of the tomato sauce. 4. Form the mixture into a loaf and place it in a shallow pan, sprayed with cooking spray. 5. Stir together the remaining tomato sauce, vinegar, sugar, mustard, Worcestershire and hot sauce. 6. Pour this sauce over the meatloaf. Bake for 1 hour, basting every 15 minutes with the pan juices.